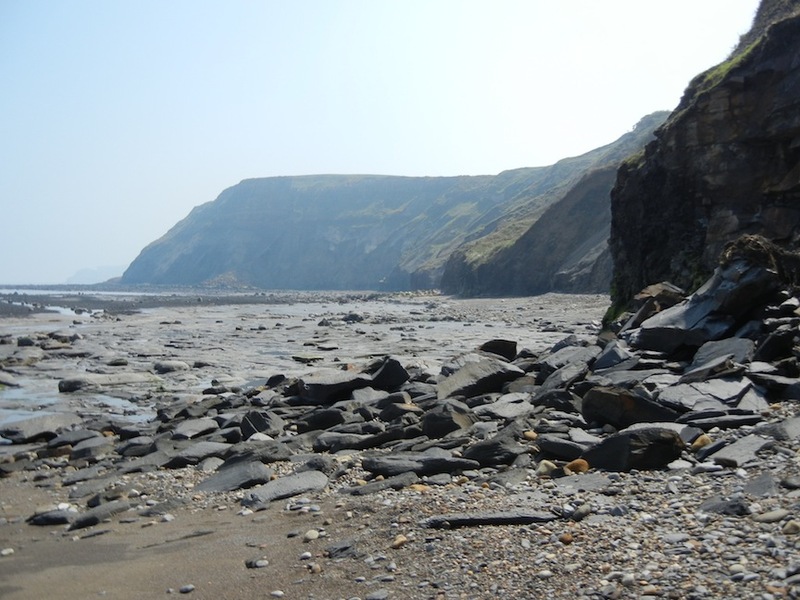 The coast of north Yorkshire surrounding the town of Whitby is a mecca for Jurassic marine fossils. 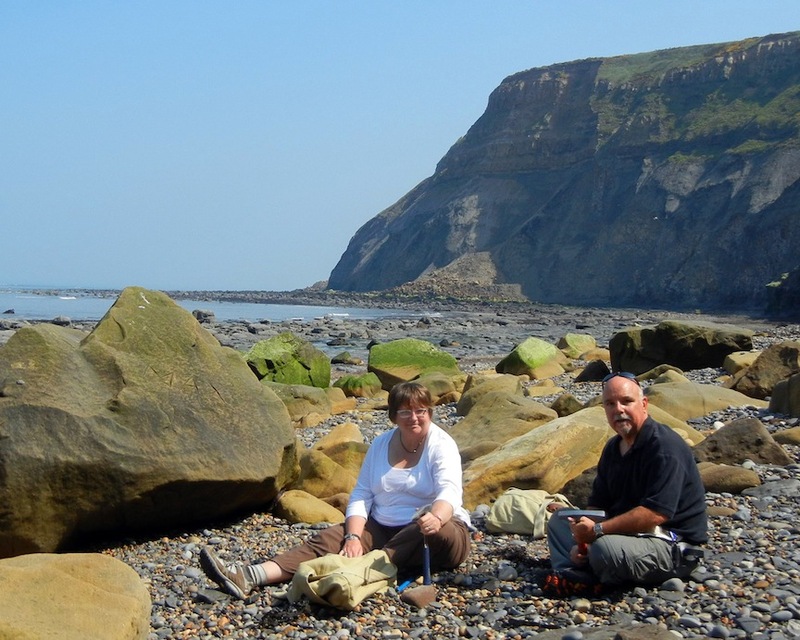 Virtually any section of the coast from Staithes to Ravenscar will offer up a bounty of ammonites and other wonderfully preserved fossils. 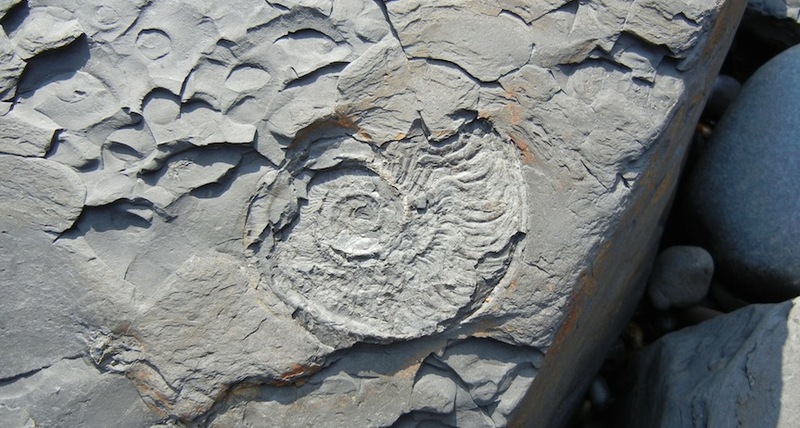 This website ---> The UK Fossils Network contains a wealth of information on each of the access points along the coast. It would be pointless to duplicate the monumental effort that has gone into this guide to the UK. I applaud them and thank them for the guidance they provided. This is the view from above at low tide. It is a considerable walk to the bottom and even more considerable walking back up with a bag of rocks! Each of these localities is along steep, unstable and rapidly eroding cliffs. It is NOT necessary to dig or otherwise search in the cliff faces. 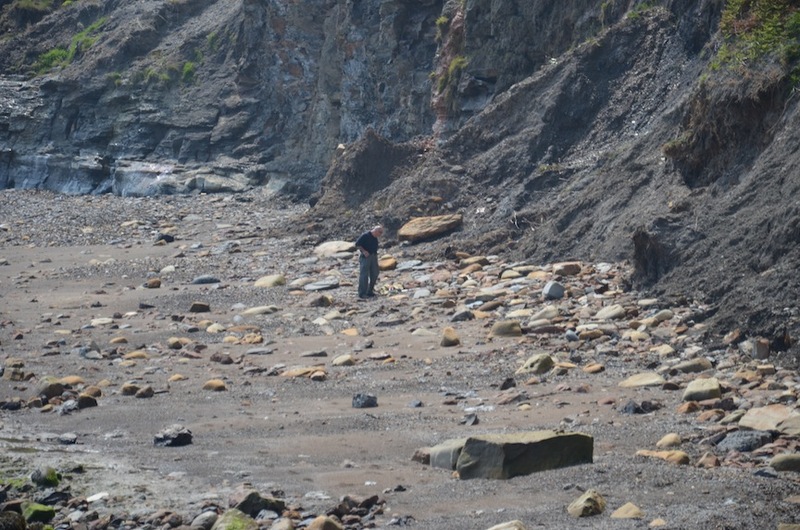 Everything we found with one exception was in the rubble on the beach or scree at the base of the cliffs. It is not just a cliche, it is the truth. The tides are your friend and foe. If not for the action of the sea, the fossils would not be washed out of the cliffs onto the shore. However, during high tides, the sea may cover the beaches and make access to the rockier areas dangerous and impassable. Pay attention to the tides. 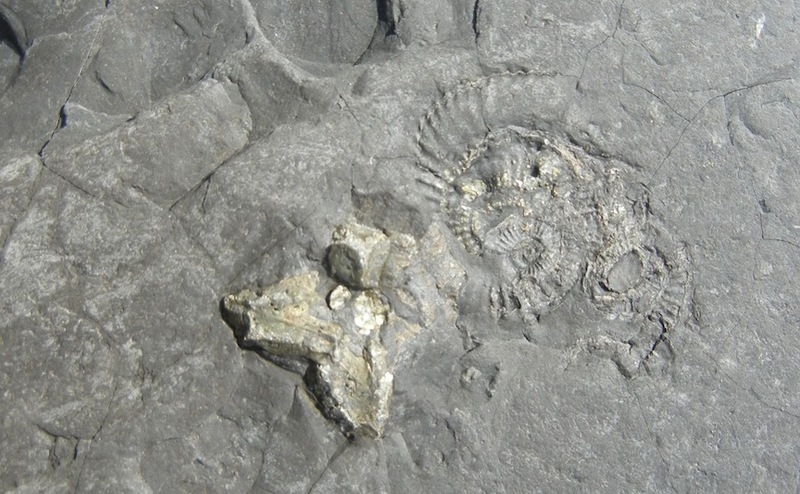 The better preserved ammonite fossils are contained in hard rounded nodules. Train your eyes to look for the dull grey muddy looking grey nodules, usually spherical or ovate in shape. They drop out of the cliffs and the sea tosses them about, wearing off the outer edges of matrix, exposing the ammonites within. the freshest ones will not likely show any signs of what is within. The harder, speckly grey nodules did seem to have much in them. They have a funny smell when you smack them with the hammer. Once at the beach level, the search begins. The action of the sea means that the fossils are spread all along the beach. One place is as good as another. Blocks of fallen shale show impressions but they are too fragile to carry off. Many different species of ammonites are represented here.The different strata have varying quality of preservation. These are what to look for as a starter. Complete nodules are harder to find, but finding the worn nodules helps to train the eye. In general, a tap on the seam with a chisel and hammer will pop the nodule open. I have to thank my wife, Karin for discovering the opportunities that the Yorkshire coast has to offer. My thanks AGAIN to the The UK Fossils Network for their hot tips!